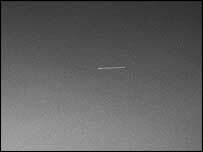 The US Spirit rover on Mars has seen a UFO streak across the Red Planet sky. Astronomers say it could be the first meteor seen from the surface of another world, or a redundant orbiting spacecraft sent to Mars 30 years ago. "We may never know, but we are still looking for clues," said Dr Mark Lemmon, from Texas A&M University. Whatever it was, Spirit was lucky to catch sight of the UFO as the rover's main mission is to look downwards to study rocks and soil on the planet. Only occasionally does it raise its sights towards the sky to study the atmosphere of Mars. But it was on just such an occasion when Spirit was observing the sky with the green filter of its panoramic camera that the roving geologist came across the surprise - a streak across the peach-coloured Martian heavens. Mission controllers say the streak was probably the brightest object in the sky at the time. If the UFO was not a shooting a star then it could have been one of seven out-of-commission spacecraft that still orbit Mars. From the object's motion, scientists do not think it was the Russian probes Mars 2, Mars 3, Mars 5, or Phobos 2; or the American probes Mariner 9 or Viking 1. That leaves Viking 2, which has a polar orbit that would fit with the north-south orientation of the streak. In addition, only Viking 1 and 2 are in orbits that could produce the type of motion as fast as that seen by Spirit.